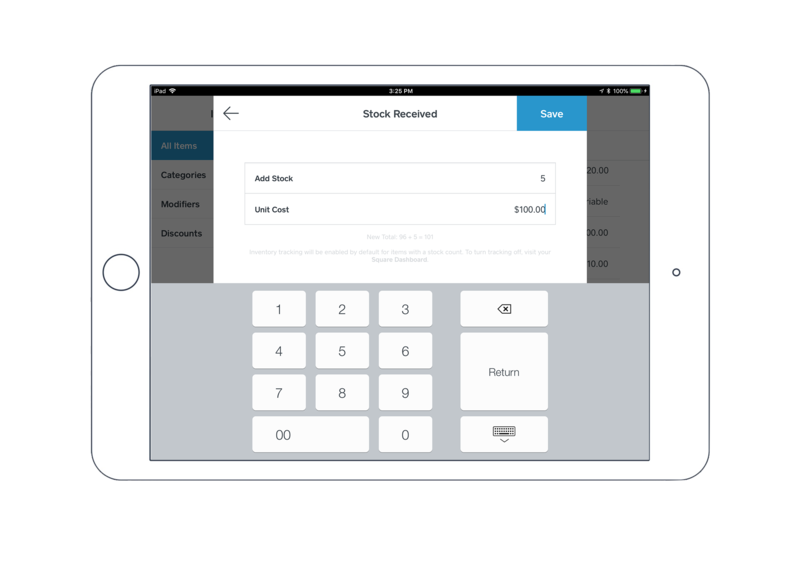 With Square’s Retail Point of Sale tools, you’re able to receive and manage inventory right from the app. On the Navigation menu, tap Add Stock. Search or scan items to receive stock > enter stock amounts. You can also scan the same item numerous times to receive multiple stocks, or scan multiple items once and adjust their quantities afterward. From the next screen, you’ll have the option to edit vendor and item information — including the item unit cost. Once you’re all set, tap Confirm. Scroll through your item list or use the search bar. Tap on the item once you find it to view the item details page. Tap the highlighted number for Current Stock. Select a reason, enter the new stock number, and tap Save. In the Retail app, tap an item to bring up the item details page. Under Stock at Other Locations, tap the blue number. Note The number listed is the total number you have in stock for all other active locations. Review the stock breakdown per location. When you select a specific location, you’ll be able to view details included in the location’s profile. Read more about managing your stock with Square for Retail.